We weld a variety of galvanized steel sheets by semi-automatic CO2 welding. However we have a hard time with postweld treatment and repair, because pits occur often and a lot of spatter is generated. Could you please explain how porosity and spatter generate with galvanized steel sheets and recommend a good welding wire to solve these problems? Galvanized steel sheets are widely used in many steel structures like cars, steel towers, bridges and buildings because of their cost-effectiveness due to excellent corrosion resistance and rust prevention. They include hot-dip galvanized steels, 5%Alalloyed hot-dip galvanized steels, 55%Al-alloyed hot-dip galvanized steels, electrogalvanized steels, and other galvanized steels. The weldability of these steels is related to the amount of zinc coating (g/m2). The thicker the zinc coating, the more the porosity (pits and blowholes) and spatter that result in arc welding. 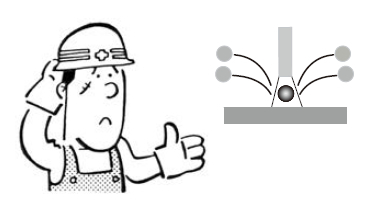 Porosity can be understood by noting that the zinc coating decomposes in the arc heat and that the zinc vaporizes at around 900°C to become a gas, causing bubbles in the weld pool and porosity in the weld metal. As to the increase of spatter, The force of the zinc vapor jet against the arc likely causes the metal droplet transfer to become unstable, thereby expelling the metal droplets outside the arc as spatter. A variety of porosity-resistant low-spatter welding wires for galvanized steel sheets have been developed. These wires have sophisticated chemical compositions that suppress the growth of gas bubbles trapped in the weld pool and stabilize metal droplet transfer. Cars, electric machinery, office equipment, and vending machines typically adopt electro-galvanized steel sheets with 50g/m2 or less of coating and alloyed hot-dip galvanized steel sheets with 40-100g/m2 of coating. For these thin-coated steel sheets, solid wires, such as MG-1Z (for CO2 gas shielding), MIX-1Z (for Ar-CO2 mixed gas shielding), and MIX-1TS (for Ar-CO2 mixed gas shielding and pulsed current) are recommended. Table 1 shows the applications for and characteristics of the above-mentioned welding wires. If you take into account the shielding gas composition and the power source output characteristics when selecting a wire, you will be able to perform highly efficient welding resulting in high quality welds, less porosity, and low spatter. electric machinery For CO2 gas shielding. ER70S-G For Ar+CO2 mixed gas shielding. Pulsed current brings about less porosity. ER70S-G For Ar+CO2 mixed gas shielding with pulsed current. Extremely less porosity and spatter.